This is what we’re about – making the voices of everyday cyclists heard. There is tremendous power in numbers. Advocacy takes many forms – targeted campaigns and programs, contacting corporate developers, meeting elected officials. The common thread is looking out for local bicyclists – focused on your interests. Great news! We’re on Amazon Smile. What is this you ask? 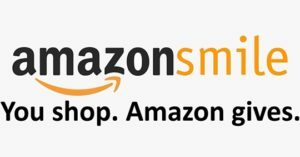 Well, it’s a great way to support local non-profits like us when you do your online shopping with Amazon. How does it work? The charity you pick is supported from every purchase order by Amazon. They contribute 0.5% toward our good work for bicycling advocacy from your purchase. It’s easy, fast, and simple. Do I have to do anything different online? Yes, kind of. Instead of just logging into Amazon.com, go to Smile.Amazon.com & select ‘Bike Miami Valley Ohio’ as your unique charity to support. We’ve made it easy for you, simply click our unique charity link right here and start shopping. 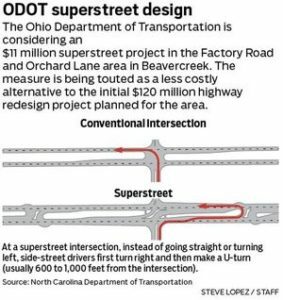 A public meeting has been scheduled for Wednesday, September 21st between 4pm and 6pm in the Beavercreek City Council Chamber, 1368 Research Park Dr., regarding plans for the Super Street intersection of Rt. 35 – which will have tremendous, negative impact on how people on bikes and pedestrians access the Creekside Trail, as well as increase travel speed and restrict local road access for transit around Rt. 35 north/south. A representative from ODOT will be in attendance, along with Beavercreek staff. The purpose is to allow individuals to ask questions and provide input on the proposed project. PLEASE SHOW UP AND SPEAK UP! If you cannot attend, please send an e-mail to Ms. Dianne Lampton, Clerk of Council at Lampton@beavercreekohio.gov and ask that your comments be entered into the public record. The current plans do not include ANY accommodation for cyclists and pedestrians to cross St. Rt. 35 at Factory Road/Orchard Lane. This is a serious issue for the community, and we must make our voices heard now. Contact 937-426-5100 for more info. The project is necessary to address the deteriorated condition of the bridge, constructed in 1956. Many of the elements of the bridge have experienced substantial deterioration. Failure to address these conditions will lead to the posting of load limits and the eventual closure of the bridge as unsafe for traffic. The project provides the opportunity to improve the pedestrian facilities on the bridge and to offer additional aesthetic treatments. The bridge superstructure, deck, and backwalls will be replaced. The abutments, wingwalls and piers will be patched and sealed. Storm pipes that outlet at the abutments will be lined. When will the project occur? The project is expected to begin in early 2018 andcontinue through the fall of 2019. ODOT is aware of the importance of this key entry to the city. During this two-year project, we are committed to minimizing traffic disruption for all users: motorists, cyclists, pedestrians, and the boating public. Traffic on the Great Miami River Recreation Trail and the Great Miami River Water Trail will be maintained when safe for users. However, occasional closures, including nights and weekends discussed above, will be required to protect trail users during overhead work. Additionally, the Great Miami River Water Trail may be restricted to specific spans within the stream channel. A signed detour and advance notice of the detour will be provided on the Recreation Trail. Appropriate notice will be provided on the River Trail to direct boaters to the appropriate bridge span. 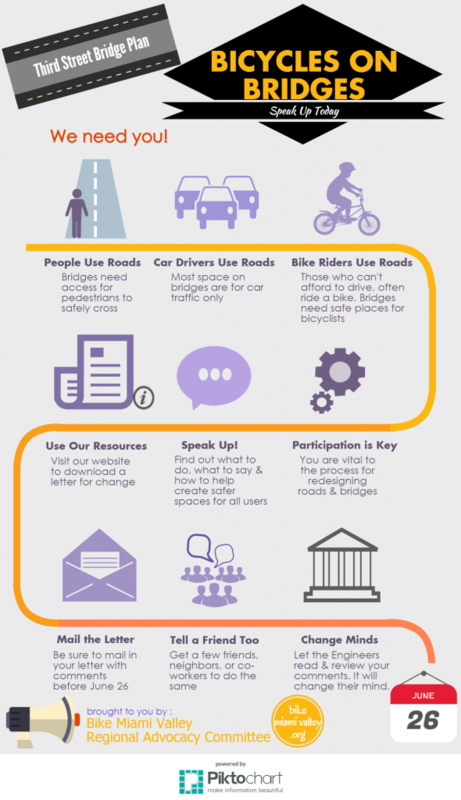 Bike Miami Valley’s suggestion: Provide adequate space on the bridge for a “Complete Street”, designed for all users: people in cars, buses, on bikes, or on foot. This is a major welcoming corridor into the heart of the region and a connection on & off the Great Miami River Trail Bikeway, both atop the levee and at water level. Emphasis on shared use trail access during construction periods, through the length of the project. Adequate detour announcements through various outlets: Parks websites, Bike Miami Valley, Miami Valley Trails website, Miami Conservancy District & through various forms like social media and print media. ** Please fill out the Comment Form & submit it. Please highlight the need for a “Complete Streets” approach. Then email contact@bikemiamivalley.org after you submit your comments to let us know you spoke-up for safer bike infrastructure, which benefits all road users. What would it take to make you more comfortable riding a bike around Centerville and Washington Twp.? Bike Centerville wants to know, and we’re giving away a chance to win a bike to those who come to the Centerville Main Library, 111 W. Spring Valley Road, on Saturday, March 19 from 1 – 4 p.m. to tell us! We’re also going to install front and rear lights on bikes of the first 10 people to ride to the event. Bike Centerville will have informational displays and maps of the region and our community. We want people to tell us what it would take for them to have a safer and more enjoyable experience riding around town and the township for errands, exercise or just plain fun. We’ll have maps to put your votes on, a survey to fill out and Bike Centerville members to talk to. We want input from people of all ages, including families, who want to ride their bikes on a regular basis without having to load them in their car and drive somewhere first. The lucky winner of the drawing will get a Main Street prototype commuter bike with seven speeds generously donated by the Huffy Bikes. The light sets have been donated by the Miami Valley Regional Planning Commission. Bike Centerville, a chapter of Bike Miami Valley, was formed last May during the Miami Valley Cycling Summit by a group of concerned residents who like to ride bikes. The group’s aim is to help make Centerville and Washington Twp. and more bicycle-friendly community. The group meets monthly on the second Wednesday. For more information about the group or its meetings and goals, contact the group’s cochairmen Ken McCall at (937) 657-8842, ken.mccall@att.net; or Stein Pedersen at (937) 304-6649, steindane@gmail.com. VOTE! VOTE! VOTE! IT IS ELECTION SEASON — TUESDAY, NOV. 3, 2015 — VOTE! VOTE! VOTE! VOTE! After reading Bike Miami Valley’s first series of “I Bike, I Walk, I Vote: Election 2015 Bicyclists Guide to Voting” Just click on the links below according to your poll location. How Bicyclists Guide to Voting is compiled: The Bike Miami Valley Regional Advocacy Committee has published the first series of Voters Guides this year to provide a forum for candidates to discuss issues of walking, bicycling, and street or trail use. Constructing a bike path through Highland Park from Steve Whalen Blvd. Bike Path to Deanwood Avenue, and through Cleveland Park from Santa Cruz Avenue to Cleveland Avenue. All appropriate street markings and signs will be placed. Bike Miami Valley’s suggestion: Provide adequate signage indicating destinations, distances, and place priority on signage at the trails end on Deanwood with sharrow lane markings through the neighborhood in both directions, until it meets the path again. The project extending the Great Miami River Bikeway west from its current terminus behind the UD softball complex, along the northwest bank of the Great Miami River and West River Road. All appropriate street markings and signs will be placed. Bike Miami Valley’s suggestion: Look into elevation of the trail after the low dam as it goes under the railroad bridge. Consider slotted metal grates or a materials that would allow faster water drainage after high water and storms. Little debris will gather on the trail making it free of perpetually slippery conditions. Projects consisdts of constructing a northbound, contra-flow bike lane along Jeffereson Street from Buckeye Street to Patterson Blvd. Lane would extend southbound also along Patterson Blvd. to East Sixth Street (behind Neon Movie Theatre)and Jefferson Street from East Fifth Street to Buckeye Street. Street lighting and walk will be constructed along Jefferson Street and Patterson Blvd. All appropriate street markings and signs will be placed. Bike Miami Valley’s Option #1 suggestion: Remove proposed bike lane on East Sixth Street, this is not a road travelled enough by cars to warrant a full lane. Instead incorporate a bike box at the stop sign to give sight-line preference to bicyclists when making a left or right turn. Place high priority on place stronger high-vis signage coming off of Rt. 35 for ‘NO TURN ON RED’ for all lanes. Place adequate signage at the off-ramp to warn cars of bicycles crossing. Look into strips of green high-vis paint at all merge and potential conflict points, intersections, etc. Place high priority on a bicycle traffic light if contra-flow on Jefferson is the best option to meet lanes at Warren and Buckeye Street. Option #2 suggestion: Continue the contra-flow bike lane further north on Jefferson until it meets up with Fourth Street. Keep the bike box on East Sixth Street. This would connect the Wayne Avenue & East Fourth Street project to Jefferson lanes, thus reducing turns, stops, and placing priority on Jefferson as the preferred bike route. Flip the parallel parking to the outside of Jefferson going north, away from the curb. Keep all signage suggestions mentioned above. Place high priority on a bicycle traffic light. Consists of constructing a bike path connector from Northcutt Place at Frederick Pike to the Stillwater River Trail. It will make connection from the Northridge Estates Neighborhood to the Stillwater River Bike Trail. The proposed path will supply access to the Stillwater Trail without having to ride on Needmore Road which is a four lane divided principal artertial with high speeds. All appropriate street markings and signs will be placed. Bike Miami Valley’s suggestion: Provide bike traffic light at crossings. Look into safety lighting at both trailheads. Place priority emphasis on directional signage with destinations and distances. The project consists of installing bike lanes along Wayne Avenue from East Fourth Street to East Fifth Street, and on East Fourth Street from St. Clair Street to Wayne Avenue. It will also resurface and replace damaged curb and walk on Wayne Avenue and East Fourth Street. A potential bulb out from the curb may be constructed along the Wayne Avenue portion to protect parking. All appropriate street markings and signs will be placed. Bike Miami Valley’s suggestion: Provide a separated buffer with paint on Wayne Avenue by reducing car travel lane widths to 10.5ft. Do not put the bike lanes right next to the ‘door zone’ of parked cars. Provide separated/ protected buffer with paint, flex posts, or another physical barrier tool. Place priority on using high-vis green paint sharrows and dashes to get people on bikes into the turn lane for Fourth Street and through the turn. Continue lane from Fourth Street onto Wayne heading south with high-vis paint in that potential turning conflict zone. Provide ‘NO TURN ON RED’ signage for all vehicles. Look into mitigating conflict zone at Wyandot Street as people turn into Warped Wing parking lot. Provide signed route with destinations and distances noted. Put the bike lane on the inside of the parked cars, remove the bulb out. Remove one parking space just after Jackson Street & Wayne South to provide visual sightline clearance for people turning left and right on a car or bike. Email: joe.weinel@daytonohio.gov **Specifically name the project and write applicable suggestions for each ***Provide your name, phone number, email address, and phone number. Wouldn’t it be nice if the bridge was for all users like this image below? Check out this short film of a trial protected bike lane! 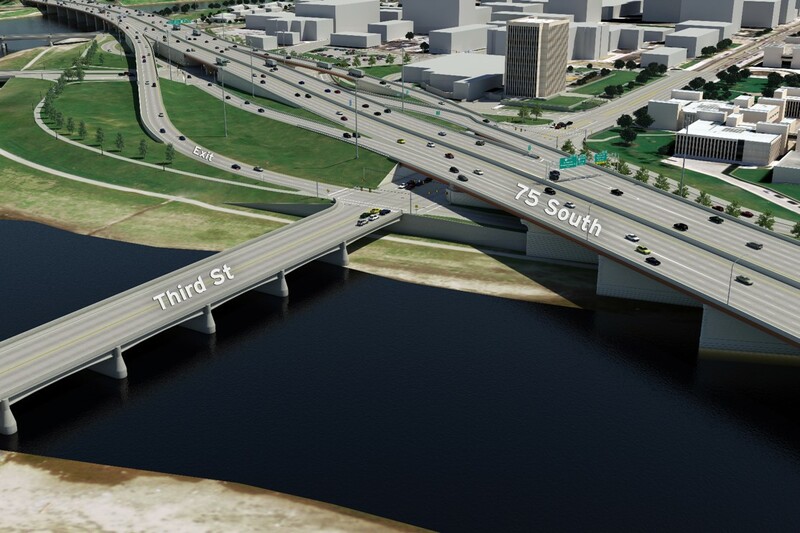 The Montgomery County Engineer’s Office is proposing to replace the Third Street Bridge over the Great Miami River in the City of Dayton. Construction is scheduled to begin in 2019. The second of three public informational open houses was held on Wednesday, May 20, 2015. 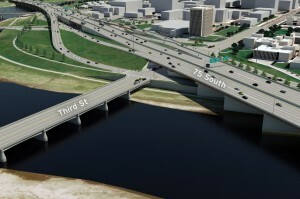 Below is a link to the presentation that was given to explain the planned improvements, show potential effects to the immediate area during construction, present expected detour routes, and outline possibilities for aesthetic and architectural treatment of the bridge. If you would like to provide comments regarding the proposed improvements, please fill out a comment sheet, see link also provided below, and mail it to Joseph Dura at the Montgomery County Engineer’s Office. Please Submit Comments: Due June 26th! Should you have any questions regarding the project, please call Joseph Dura of the Montgomery County Engineer’s Office at (937) 225-5507 or e-mail at duraj@mcohio.org. If you have a project and need help, contact us by clicking here!